Connect with IPCO's premier platform for cloud based unified communication and experience the new and modern way of doing communication. With IPCO Cloudfone Biz, communication has never been more easy. Experience our secure and highly reliable cloud service, providing you with crisp and clear voice or video communications wherever you are. Combine traditional fixed telephony with flexible softclients to give your users the best of breed in communications. Chat, meet, talk and collaborate with the easy-to-use functionality in Cloudfone Biz. Invite people outside of your organisation to a video conference. Our conferencing service let you connect with a browser to the video session. Add an auto attendant for your business. Use our intuitive web solution to configure the options in your auto attendant. We built our IPCO Cloudfone Biz to be modular and flexible. And as such we can accommodate a large number of uses cases. 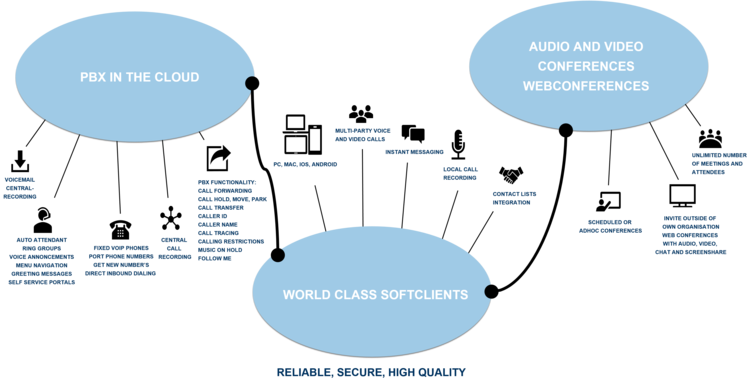 The platform is used as a traditional hosted PBX solution, as part of a home care solution with video calling in closed groups, in doctor-patient consultations and in a lightweight call center solution. please give us a try and you'll find we can help you out with your unified communications needs!